This article is about the Chinese Cultural Revolution. For Iran, see Iranian Cultural Revolution. For Libya, see Cultural Revolution (Libya). For Romania, see July Theses. Cultural Revolution propaganda poster. It depicts Mao Zedong, above a group of soldiers from the People's Liberation Army. The caption says, "The Chinese People's Liberation Army is the great school of Mao Zedong Thought." The Cultural Revolution, formally the Great Proletarian Cultural Revolution, was a sociopolitical movement in China from 1966 until 1976. 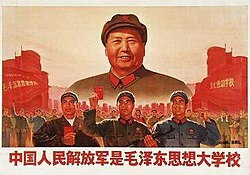 Launched by Mao Zedong, then Chairman of the Communist Party of China, its stated goal was to preserve Chinese Communism by purging remnants of capitalist and traditional elements from Chinese society, and to re-impose Mao Zedong Thought (known outside China simply as Maoism) as the dominant ideology within the Party. The Revolution marked Mao's return to a position of power after the failures of his Great Leap Forward. The movement paralyzed China politically and negatively affected both the economy and society of the country to a significant degree. The movement was launched in May 1966, after Mao alleged that bourgeois elements had infiltrated the government and society at large, aiming to restore capitalism. To eliminate his rivals within the Communist Party of China (CPC), Mao insisted that revisionists be removed through violent class struggle. China's youth responded to Mao's appeal by forming Red Guard groups around the country. The movement spread into the military, urban workers, and the Communist Party leadership itself. It resulted in widespread armed clashes between conservative and radical factions in all walks of life, as a result of Mao's open call for "all-round civil war" against the conservatives in the communist party establishment. In the top leadership, it led to a mass purge of senior officials, most notably Liu Shaoqi and Deng Xiaoping. During the same period, Mao's personality cult grew to immense proportions. In the violent struggles that ensued across the country, millions of people were persecuted and suffered a wide range of abuses including public humiliation, arbitrary imprisonment, torture, hard labor, sustained harassment, seizure of property and sometimes execution. A large segment of the population was forcibly displaced, most notably the transfer of urban youth to rural regions during the Down to the Countryside Movement. Historical relics and artifacts were destroyed and cultural and religious sites were ransacked. Mao officially declared the Cultural Revolution to have ended in 1969, but its active phase lasted until the death of military leader and proposed Mao successor Lin Biao in 1971. After Mao's death and the arrest of the Gang of Four in 1976, reformers led by Deng Xiaoping gradually began to dismantle the Maoist policies associated with the Cultural Revolution. In 1981, the Party declared that the Cultural Revolution was "responsible for the most severe setback and the heaviest losses suffered by the Party, the country, and the people since the founding of the People's Republic". In 1958, after China's first Five-Year Plan, Mao called for "grassroots socialism" in order to accelerate his plans for turning China into a modern industrialized state. In this spirit, Mao launched the Great Leap Forward, established People's Communes in the countryside, and began the mass mobilization of the people into collectives. Many communities were assigned production of a single commodity—steel. Mao vowed to increase agricultural production to twice 1957 levels. The Great Leap's failure reduced Mao's prestige within the Party. Forced to take major responsibility, in 1959, Mao resigned as the President of the People's Republic of China, China's de jure head of state, and was succeeded by Liu Shaoqi. In July, senior Party leaders convened at the scenic Mount Lu to discuss policy. At the conference, Marshal Peng Dehuai, the Minister of Defence, criticized Great Leap policies in a private letter to Mao, writing that it was plagued by mismanagement and cautioning against elevating political dogma over the laws of economics. Despite the moderate tone of Peng's letter, Mao took it as a personal attack against his leadership. Following the Conference, Mao had Peng removed from his posts, and accused him of being a "right-opportunist". Peng was replaced by Lin Biao, another revolutionary army general who became a more staunch Mao supporter later in his career. While the Lushan Conference served as a death knell for Peng, Mao's most vocal critic, it led to a shift of power to moderates led by Liu Shaoqi and Deng Xiaoping, who took effective control of the economy following 1959. By the early 1960s, many of the Great Leap's economic policies were reversed by initiatives spearheaded by Liu, Deng, and Zhou Enlai. This moderate group of pragmatists were unenthusiastic about Mao's utopian visions. Owing to his loss of esteem within the party, Mao developed a decadent and eccentric lifestyle. By 1962, while Zhou, Liu and Deng managed affairs of state and the economy, Mao had effectively withdrawn from economic decision-making, and focused much of his time on further contemplating his contributions to Marxist–Leninist social theory, including the idea of "continuous revolution". This theory's ultimate aim was to set the stage for Mao to restore his brand of Communism and his personal prestige within the Party. In the early 1950s, the People's Republic of China and the Soviet Union were the two largest Communist states in the world. Although initially they had been mutually supportive, disagreements arose after the death of Joseph Stalin and the rise of Nikita Khrushchev to power in the Soviet Union. In 1956, Khrushchev denounced Stalin and his policies and began implementing post-Stalinist economic reforms. Mao and many members of the Chinese Communist Party (CCP) opposed these changes, believing that they would have negative repercussions for the worldwide Marxist movement, among whom Stalin was still viewed as a hero. Mao believed that Khrushchev did not adhere to Marxism–Leninism, but was instead a revisionist, altering his policies from basic Marxist–Leninist concepts, something Mao feared would allow capitalists to regain control of the country. Relations between the two governments soured. The USSR refused to support China's case for joining the United Nations and went back on its pledge to supply China with a nuclear weapon. Mao went on to publicly denounce revisionism in April 1960. Without pointing fingers at the Soviet Union, Mao criticized its ideological ally, the League of Communists of Yugoslavia. In turn, the USSR criticized China's ally the Party of Labour of Albania. In 1963, the CCP began to openly denounce the Soviet Union, publishing nine polemics against its perceived revisionism, with one of them being titled On Khrushchev's Phoney Communism and Historical Lessons for the World, in which Mao charged that Khrushchev was not only a revisionist but also increased the danger of capitalist restoration. Khrushchev's downfall from an internal coup d'état in 1964 also contributed to Mao's fears of his own political vulnerability, particularly because of his declining prestige among his colleagues after the Great Leap Forward. Yao's article put Beijing Mayor Peng Zhen on the defensive. Peng, a powerful official and Wu Han's direct superior, was the head of the "Five Man Group", a committee commissioned by Mao to study the potential for a cultural revolution. Peng Zhen, aware that he would be implicated if Wu indeed wrote an "anti-Mao" play, wished to contain Yao's influence. Yao's article was initially only published in select local newspapers. Peng forbade its publication in the nationally distributed People's Daily and other major newspapers under his control, instructing them to write exclusively about "academic discussion", and not pay heed to Yao's petty politics. While the "literary battle" against Peng raged, Mao fired Yang Shangkun—director of the Party's General Office, an organ that controlled internal communications—on a series of unsubstantiated charges, installing in his stead staunch loyalist Wang Dongxing, head of Mao's security detail. Yang's dismissal likely emboldened Mao's allies to move against their factional rivals. In December, Defence Minister and Mao loyalist Lin Biao accused General Luo Ruiqing, the chief of staff of the People's Liberation Army (PLA), of being anti-Mao, alleging that Luo put too much emphasis on military training rather than Maoist "political discussion". Despite initial skepticism in the Politburo of Luo's guilt, Mao pushed for an 'investigation', after which Luo was denounced, dismissed, and forced to deliver a self-criticism. Stress from the events led Luo to attempt suicide. Luo's removal secured the military command's loyalty to Mao. Having ousted Luo and Yang, Mao returned his attention to Peng Zhen. On February 12, 1966, the "Five Man Group" issued a report known as the February Outline (二月提纲). The Outline, sanctioned by the Party centre, defined Hai Rui as constructive academic discussion, and aimed to formally distance Peng Zhen from any political implications. However, Jiang Qing and Yao Wenyuan continued their denunciation of Wu Han and Peng Zhen. Meanwhile, Mao also sacked Propaganda Department director Lu Dingyi, a Peng Zhen ally. Lu's removal gave Maoists unrestricted access to the press. Mao would deliver his final blow to Peng Zhen at a high-profile Politburo meeting through loyalists Kang Sheng and Chen Boda. They accused Peng Zhen of opposing Mao, labeled the February Outline "evidence of Peng Zhen's revisionism", and grouped him with three other disgraced officials as part of the "Peng-Luo-Lu-Yang Anti-Party Clique". On May 16, the Politburo formalized the decisions by releasing an official document condemning Peng Zhen and his "anti-party allies" in the strongest terms, disbanding his "Five Man Group", and replacing it with the Maoist Cultural Revolution Group (CRG).